Rush has the distinction of having two albums spotlighted on the excellent Classic Albums series, and they are undoubtedly special and crucial to the band’s history. “2112,” first released in 1976, has a sci-fi/Ayn Rand-influenced storyline in the epic title track, highlighting the theme of the individual and society. The album was a turning point for the band at a time where they had to deliver on a hit album (following the disappointing Caress of Steel) or face being dropped by their record label. It was a huge hit and set the wheels in motion for the blockbuster Moving Pictures, released five years later. It found Rush steering away from the sidelong album track and towards more shorter, cohesive and accessible songs. 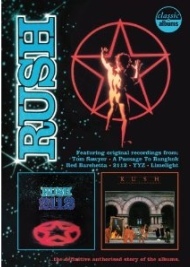 It yielded three songs that have gone onto become rock classics: the signature “Tom Sawyer,” “Red Barchetta” and “Limelight.” All the music from both 2112 and Moving Pictures highlight the dynamic and powerful musicianship of guitarist Alex Lifeson, singer/bassist Geddy Lee and drummer and lyricist Neil Peart. The three principals and producer Terry Brown are interviewed for the program to reflect on the making of the albums and the stories behind the songs. The special highlights what makes this Canadian rock band so unique and will probably add fuel to the fire about getting Rush inducted into the Rock and Roll Hall of Fame.